Traditionally places to avoid, school toilets have long suffered from a bad reputation for being places that waste resources, focus bad behviour and smell really bad! But what if this could be changed? What if school toilets could be a place to learn? A place to conserve resources, setting the tone for the rest of the school to follow? What if school toilets could be a place to learn? At the heart of the scheme is the better use of space within the original 1950’s school building. The two over-generous toilets have been used to create a series of new spaces. At one end of the building new toilets for boys and girls have been created via a shared access and communal basin. At the other end of the building the former toilet space has been used to create a new classroom for supporting peripatetic teaching. Every detail of the toilets was designed to be informative as well as practical. 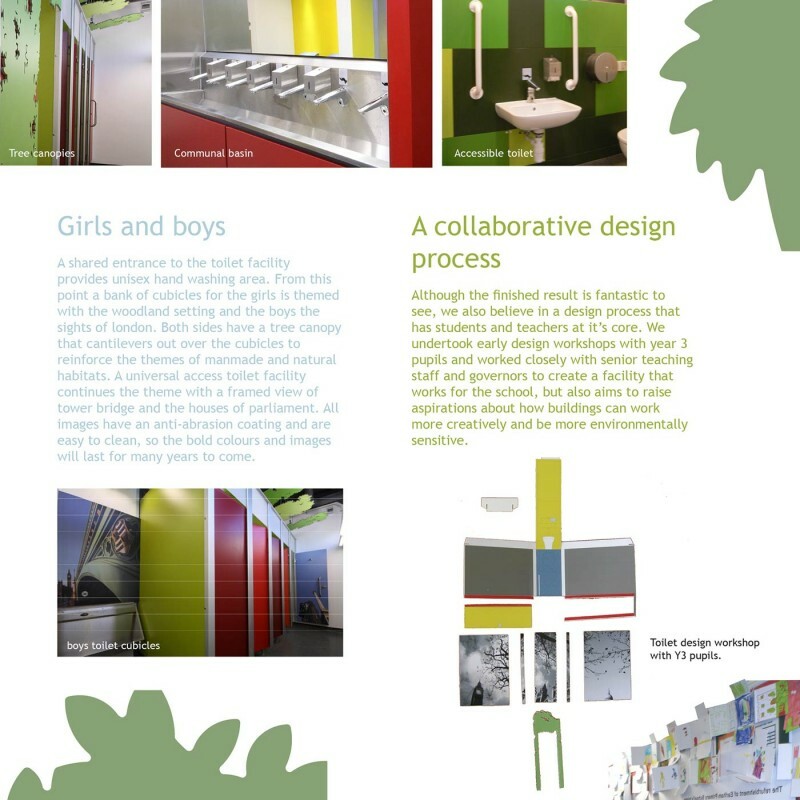 A large format diagram covering the walls at the entrance to the toilets explains the workings of the toilets and incorporates water and electricity usage readout so pupils can monitor the resources used. The woodland and London building images in the toilet cubicles reflect the history of the schools’ location in Forest Gate, which used to be the entrance to royal hunting forest estates. The sights of central London represent the places not so far away that many of the pupils are yet to visit.